The Leebhof is a beautifully restored 500-year-old family farm. Three tastefully furnished holiday apartments in a quiet, sunny location. 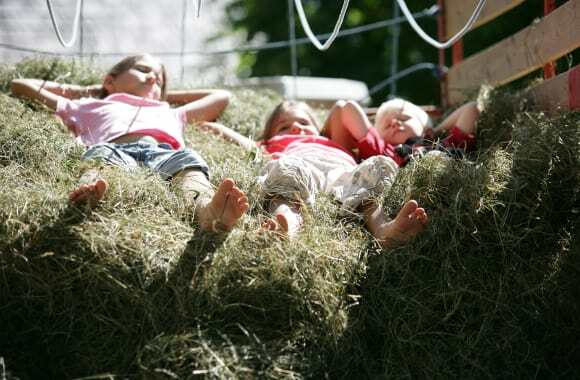 Large flower garden, old fruit trees, fountain, snug seating and a new spa area with Swiss pine wood sauna, hay and herbal baths, hay bed... a place of dreams for both young and old alike . Little cats, rabbits, goats on a tether, cows, knead bread, tractor rides on the alpine pasture, bread on a stick and campfire... 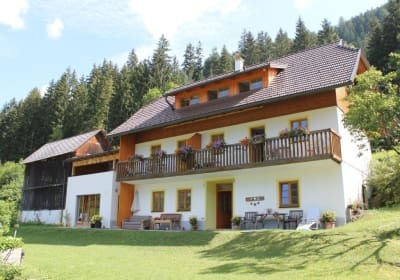 Plenty of gentle nature in the Nock Mountains and all kinds of clean bathing lakes (Lake Millstädt, Lake Ossiach, Lake Wörth), thermal baths and lots of excursion destinations nearby! We are looking forward to your visit! Regionale Produkte sind in der näheren Umgebung zu kaufen. Cosy attic apartment with gallery for 2 to 6 persons. Lots of light-coloured wooden furniture, two bedrooms, a large living room with satellite TV and kitchen incl. dishwasher and dining nook, two beds on the gallery, balcony, shower/WC, and private entry. 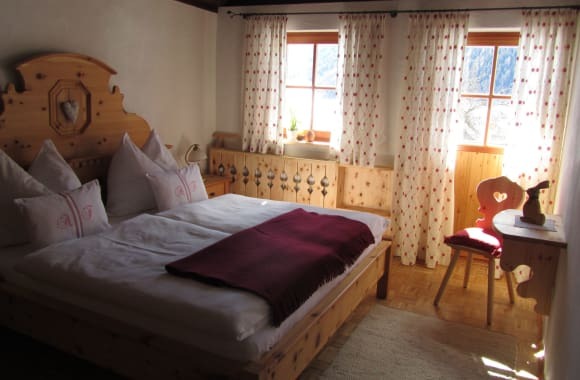 Romantic & rustic for 2 to 4 persons, comfortably furnished with wooden furniture. The apartment offers a bedroom with four-poster bed, a small bedroom with two beds, a living room with satellite TV and kitchenette incl. dishwasher and dining nook, balcony, shower/WC, a large bathroom with tub and shower, an additional WC, infrared heated cubicle and private entry. furnished apartment. It features a bedroom, a separate children's room with bunk bed, a living room with pull-out couch and a kitchenette with dining nook, balcony, shower/WC. "A dairy hut with wooden logs - small sauna"Even our old aunt, formerly a Sennerin (dairymaid), had this to say when the Leebhütte was converted: "Never been lovelier". It has been fullyrefurbished, but still preserves theoriginal structure in order to give guests a sense of the cabin's history. You'd never guess how spacious it is inside. The parlour with its large wooden table. Up top there are 3 rooms (7 beds), with another on the ground floor that is appointed with great-grandmother's old furniture (2 beds). There is also running water, a shower and a WC . Heating is supplied by firewood, the tiled stove and the water heater. There is now also solar electricity (for safety reasons) for the light and radio. Outside the cabin is a small farm garden, where you are welcome to pick your own. Proceed down a couple of stone steps to the sauna cabinwhich is obviously great for sweating out all your toxins. Those who dare can venture under the ice-cool waterfall to cool off! Or enjoy the wonderful views at the sun bridge by the bathing pool with views of the cross at the top of the Kaiserburg. 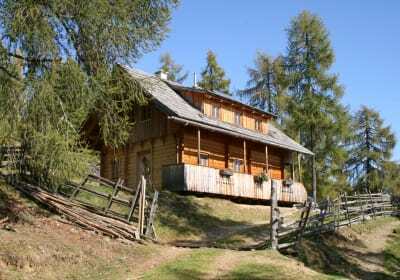 Arrival: 10 km from Patergassen, the agricultural road leads up to the cabin. Recharge your batteries in this charming secluded location! The alpine cabins are set at an altitude of approx. 1750 - 1800 m and nestle among the wonderful shapes of the Nock Mountains at the foot of the Kaiserburg. 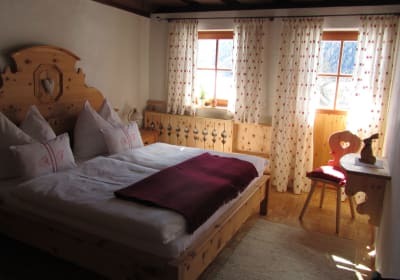 If you make your way over the ridge on one of your hikes, you will find the tavern forest cabin and the Geigerhütte a little further on ... the famous world cup site of Bad Kleinkirchheim is also just behind the mountain. From the Kaiserburg mountain station you can therefore also take the lift down into the valley and bathe in the thermal spa.Arriving: 10 km from Patergassen, the agricultural road leads to the cabin.